Quilling miniatures is an art in itself. It requires quite a lot of precision to get the right size and look. I have made 2 flower pots with roses. Have a look! The pots are easy to make. i have used the pearlised 3mm quilling strips atleast 3 of same colour and then pushed the center with a quilling tool or a toothpick/pen to get the pot. tap the bottom on the floor to make it stand. Add some glue inside to make it hard and set it aside. 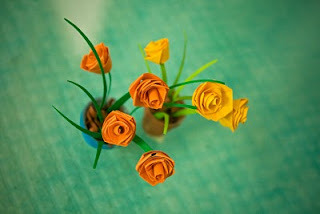 Folded roses were made with 1/3 a strip of a 5 mm coloured quilling strip. The leaves and stems are made by folding a green strip and gluing it to make to it stronger. Then cut along a sharp end to get the grass look. It was a challenge to make the roses and the grass stand in the pot so i used a 3mm brown strip and rolled it along a toothpick then cut the rolled strips into tiny parts to add volume to the pot as a base. And Voila you got yourself a pretty flower pot! Миниатюрки прекрасны, а, я ни как не могу отважиться на такую ювелирную работу. 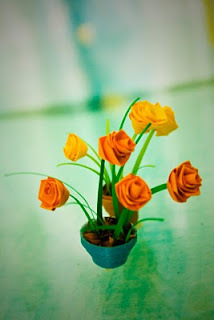 Folded Roses....got them rigth at first try!